Welcome to my collection of photographs and commentary on historic homes and buildings in various cities. I'm most interested in apartment buildings and multi-family homes, but will include any building that appeals to me. Usually, when we drive to Florida we enter the state by way of Interstate 75, but on a recent visit a traffic back-up motivated us to seek out an alternate route. In Valdosta, we got off 75 and headed south on U-S 41. This building caught my attention as we crossed the state line into the Sunshine State just north of Jasper, Florida. I recognized the building right away. It is one of the old Florida Welcome Centers, long out of business at this location (as is Cooter Jack's, which, as the sign indicates, took over the building for a while). 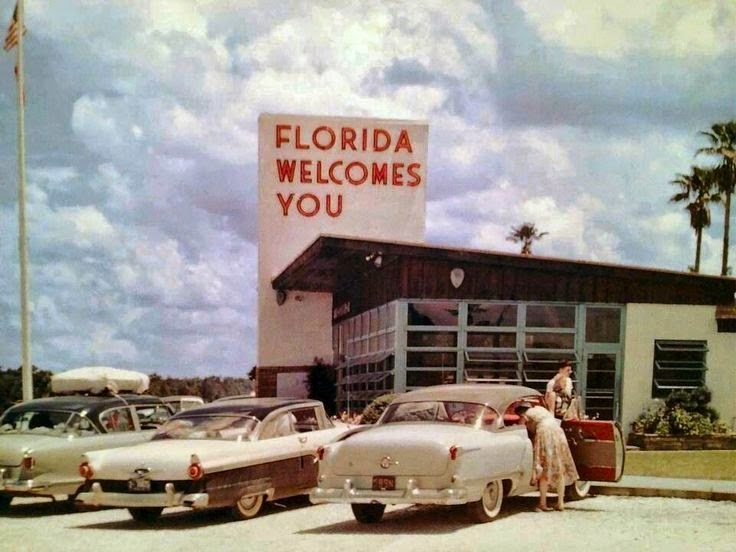 The state maintained a number of welcome centers just like this one beginning in the 1950s on major highways entering Florida. These days, more modern versions welcome travellers on the interstates. These smaller centers dating back to the '50s are long shuttered. A comparison of the vintage photo with the current condition of the building reveals the awning windows have been covered, dramatically changing the appearance of the building. The good news, though, is that the building survives. So cool...I remember visiting these when I was a kid. Thank you. I'm with Coldwell Banker in Avondale. There are three elements of management which should be considered when reviewing property management companies Denver and selecting one to hire. The first is services offered to the landlord, the second is company demographics and finally visibility in the community. My career in local television news has taken me all over the country. TV news is and has been my focus and love, but I've retained a life-long interest in buildings and architecture that began in the historic neighborhoods of my hometown of Jacksonville, Florida. When I was growing up I often urged my dad to "drive through Riverside (or Avondale/San Marco/Springfield) on the way home." I wanted to see the old houses and buildings. They made me happy. They still do. I don't live in Jacksonville anymore, but my wife and I have a "getaway" place on the river in San Marco and we are often there. And just as when I was a kid, I still enjoy walking, biking or driving through these historic neighborhoods on the St. Johns River. The streets are lined with live oaks and palm trees, beautiful homes, inviting apartment buildings and small neighborhood commercial buildings dating back to the turn of the last century. I'd like to share some of my favorites on this blog. I intend to eventually add pictures and commentary on historic neighborhoods in other cities that I love, but I'm starting with Jacksonville because that's where I started. Copyright 2017 by Mike Dreaden. Simple theme. Powered by Blogger.